At the award-winning gourmet restaurant Landgasthaus Heiligenhausen, he used only regional products and focused on the creative side of cooking. Karsten Wolf then headed to the island of Amrum in the North Sea, where he worked at the distinguished Hotel Seeblick. He then returned to Bavaria at the end of the 1990s. At the private clinic Jaegerwinkel in Bad Wiessee, he learned more about healthy cuisine, became a certified dietary chef, and served as head chef in the last few years he worked there. 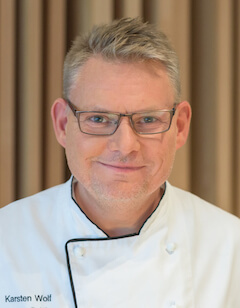 At the award-winning Lanserhof Tegernsee, Karsten Wolf sees the perfect opportunity to incorporate his expertise and knowledge into the modern dietary kitchen and Energy Cuisine. » You Have to Try This Fitness Burger!